1. Doggy Massage. Our dogs love massage and petting even more as they age. They especially enjoy love and attention from the humans they're closest with. Evidence suggests that touch has very positive effects on the body and is good for many health related problems by lowering the amount of cortisol (stress hormone) in our blood, and also increases the levels of dopamine (feel good chemical) in the brain. Touch has the same effect on our aging dogs. There are several good articles on-line and videos on YouTube that show some basic massage techniques we can use on our fury friends. Try this video to start. Just plain old petting and affection goes a long way too. 2. Provide an Orthopedic Memory Foam Dog Bed. Senior dogs should have a comfortable memory foam dog bed in every room where they lay down. According to Jacob Hamilton, owner of Better World Pets, make sure the bed is actually orthopedic with thick memory foam (at least 4 inches). It's important to have a NON-SKID BOTTOM to avoid injuries from sudden slipping and WATERPROOFING to protect the memory foam mattress. Orthopedic memory foam dog beds will significantly ease the aches and pains associated with joint/muscle/hip pains common in aging dogs. Make sure you read the details, specifications, and reviews of the bed. Many call their beds "orthopedic", but they're not memory foam. 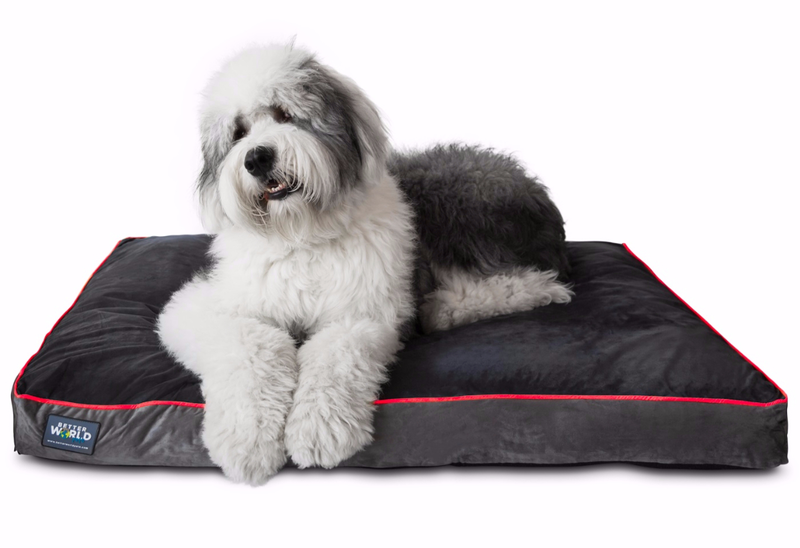 This 5" thick waterproof, memory foam dog bed has consistently been rated one of the most orthopedic beds on the market and the best value. 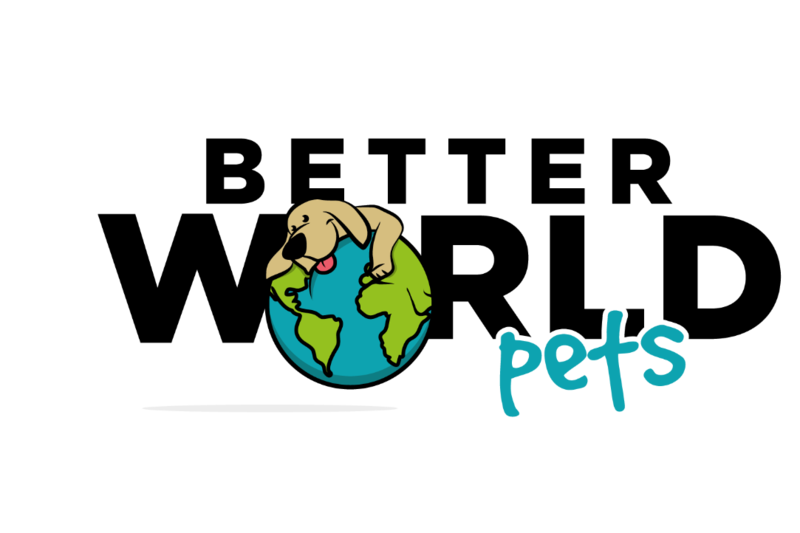 The best part is that Better World Pets donates 10% of their profits to the Humane Society! 3. Gentle Physical Exercise. It's vital your dog still receive daily exercise. You want to keep your dog moving so they don't stiffen up and lose mobility. Make sure you take it easy and stop if your dog is showing signs of discomfort or stress though. You can try a treadmill to offer controlled steady walking. Daily walks should still be considered mandatory for an aging Fido. Dogs really enjoy seeing new places and experiencing unfamiliar smells. Make sure you switch up your walks so they stay engaged and excited. Most aging dogs love to take a car ride or travel with their best human friends also. There's a ton of dog-friendly hotels now, so consider bringing your fury friend along on your next vacation. 4. Mental Exercise. Don't forget your dog also gets exercise from mental stimulation. 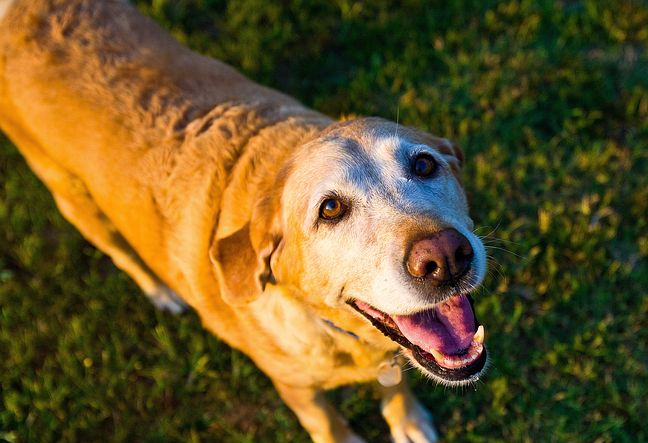 We tend to forget about exercising our dog's mind once they reach a certain age, but it's important for their overall health and well-being to continue daily mental activity and training. Plus, they love it! There are several articles on-line and videos on YouTube explaining senior dog friendly games and activities we can do with them. There are many games that require very little mobility to perform. Just 15 minutes a day of these type of exercises can have huge benefits to your dog's overall health. After all, they're mammals just like us. Here's a great game you can play with your furry friend: Getting your dog to use his nose to find hidden treasure, like his favorite toy or treat, will stimulate all of his senses and build a positive bond between the two of you. To teach your senior pup how to play hide and seek, first command him to sit and hide the prize in an obvious area so he can watch to see where you’re putting it. Then give him a release signal to go find the toy. Once he finds the toy, reward him big time. Once your dog is familiar with the rules, ramp up the difficulty of the exercise by hiding the toy or treat in a different room or underneath something. Get creative and hide the treats in cardboard boxes, in between couch cushions, or in different parts of your home. 5. Healthy Treats. What dog doesn't love a tasty treat? You don't need a special occasion to pamper your dog with lavish treats, but even senior pups should "earn" their food. 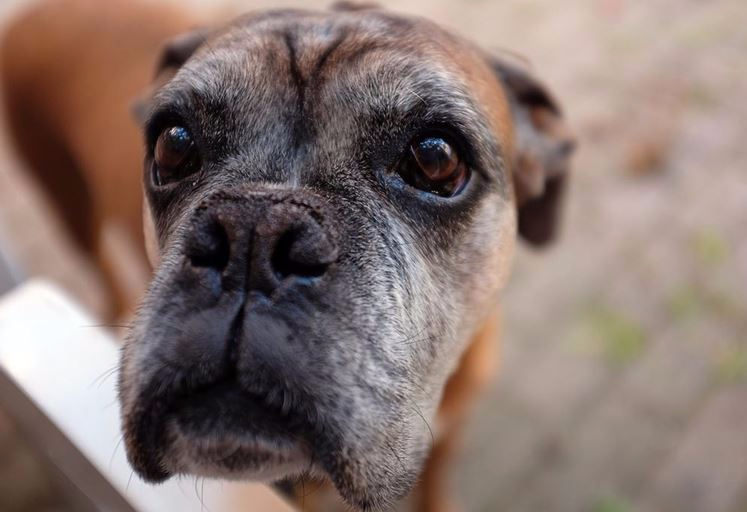 Aging dogs still benefit from basic commands and training techniques. Mammals don't mind a good challenge every now and then. Yes, that means you too! However, closely monitor your dog's diet. If your dog is carrying around extra weight that will add extra strain on joints worsening the pain of arthritis, hip dysplasia, and other age related physical ailments. Also, provide a raised feeder system. Eating from bowls on the floor can strain your fury friend's back and neck. According to WebMD, treats and snacks should only make up 10% of a dog's daily calories. To get an idea of how many treats that is, ask your vet. 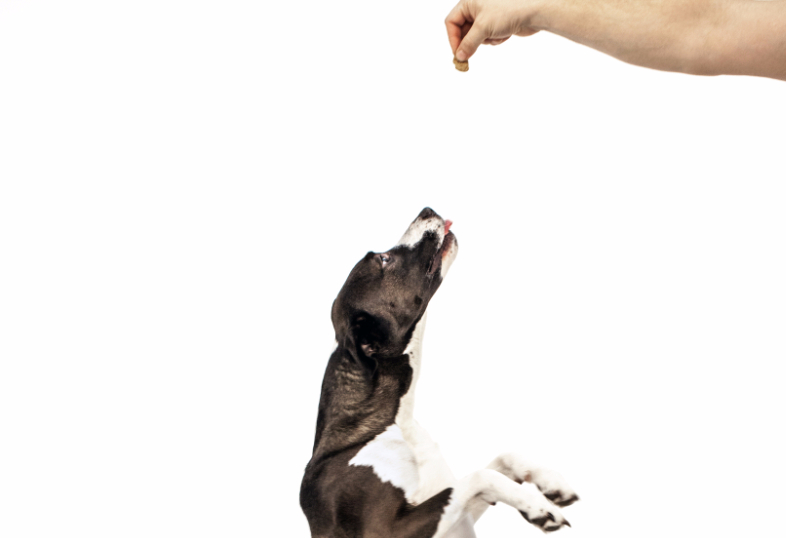 They can make a recommendation based on the treats your dog likes, his weight, and how active they are. 6. Pawdicure. Yes, your dog can get a paw pedicure. They're not just for humans. Admittedly, your dog may not thoroughly enjoy having their nails worked on, but they'll thank you later. If your dog is not active outdoors anymore, their nails may not naturally file down. This means your furniture and floors can take a beating. We hope they're still not jumping on people in their senior years, but that would be bad for obvious reasons. Also, long hair dogs need their paw hair trimmed. Otherwise, that long hair can cause them to slip around, which can injure older dogs. You can either gear up yourself or take them to a professional groomer. We highly recommend taking them to a groomer. Pampering your dog should be fun for both of you. IF YOU'RE SERIOUS ABOUT PAMPERING YOUR DOG, THE FIRST THING YOU CAN DO IS PURCHASE A MEMORY FOAM BED TODAY. Dogs spend over 50% of their lives at rest, and senior dogs spend even more time than that laying on their beds. You can make a huge impact in their lives right now. Better World Pets offers 3 different sizes of orthopedic memory foam beds for any size dog. The beds are over 5" thick of pure premium shredded memory foam. Our beds are waterproof and have a special non-skid material on the bottom to prevent the bed from sliding around. Our covers are twice as strong as most beds (180 gsm fabric) and the covers are completely removable and machine washable. Best of all we donate 10% of our profits to the Humane Society! This bed is AMAZING if you have an older dog with "bone" problems. Our dog, who will be 13 in December (a 100 pound black lab) is still a happy boy who loves his food and still loves playing with his toys. However, the poor thing has major back, neck and leg problems and can not function the way he used to. The old bed he had was soft and would slide all over the floor when he tried to get up and it was getting to the point that he could NOT get up anymore and we would have to help him. This new bed is fantastic for him! My 13 year old Black Lab suffers from severe arthritis. His old bed was worn, so after searching and reading reviews I decided on this one. As soon as I brought it in to him he went right to it and laid on it and he rarely leaves it. He has always been a "grouchy" dog too, but since having his new bed he growls less and even gives kisses to the other dogs. I wish I had found this product years ago. My 16 year old dog loves this bed. As you can imagine she has arthritis at this age, but still manages to run around like she's 7. She spends a lot of time on this bed and I feel like it's helped her joints feel a lot better. Definitely worth every penny. She's a 16 pound Italian greyhound mix so she basically has a king size bed, which she deserves since she's the love of my life. My dog had a complete ACL tear in her hind leg. This is an excellent high-quality orthopedic bed. As one who has purchased many beds for aging and pet suffering from joint pain, this is at the top of my list. I had several questions which I communicated to Better World Pets. Within hours I had all my questions addressed. 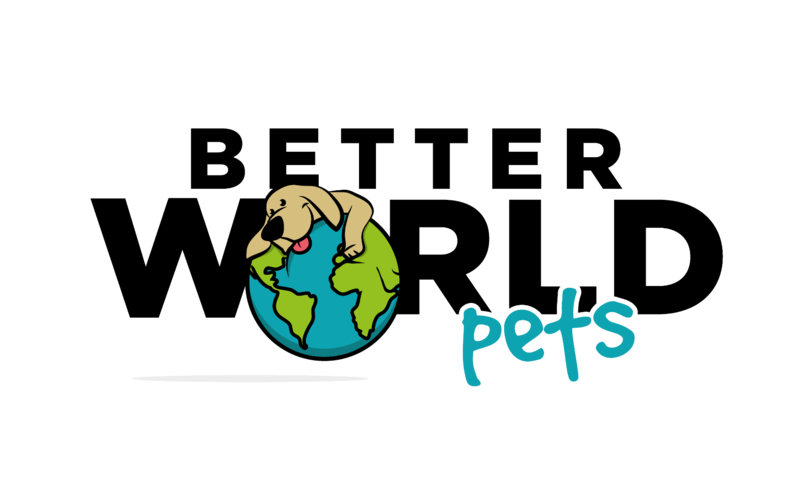 The customer service and product quality of Better World Pets is second to none. You will not regret this purchase. JOIN THE BETTER WORLD CLUB!